Lolli and Pops, Inc. is a premium specialty retailer offering an assortment of confections, chocolates, sweets, and gifts from around the world. As of July 2018, it operates 57 shops throughout the United States. Its headquarters are located in San Francisco, where it was established in 2012. When you open a store or website, you're not just opening a business — you're creating a platform to display your core values. That's what the people behind Lolli & Pops, the chain of 38 sweet shops in 17 states, believe. And the customer experience at Lolli & Pops certainly backs up that belief. The company's goal is "to delight people" and its core values include hospitality, generosity, thoughtfulness, and surprise. Hospitality is on display at Lolli & Pops as you are immediately greeted and welcomed when you enter one of its stores, which can usually be found in popular malls such as the Shops At Mission Viejo in Southern California and Garden State Plaza in New Jersey. The greeters are "Chief Purveyors" (general managers) or "Magic Makers" (staff) and their job is to get you right into the Lolli & Pops experience by offering you samples. In fact, employees have the license to open any product and share it with you. "By opening something and eating it together, you get an immediate human interaction," says Jessica Mennella, vice president of merchandising. "That interaction is what drives people into our doors and to be a part of what we're creating." Extensive sampling also conveys generosity, and based on countless reviews online, it's clear customers are seduced into becoming brand fans one taste at a time. The company also expresses generosity by serving up their products as gifts to be given, either to others or to yourself. Gift boxes are so exquisitely designed, they could almost be gifts themselves, and they're always displayed with notecards to signal that the brand is something intended to be shared. 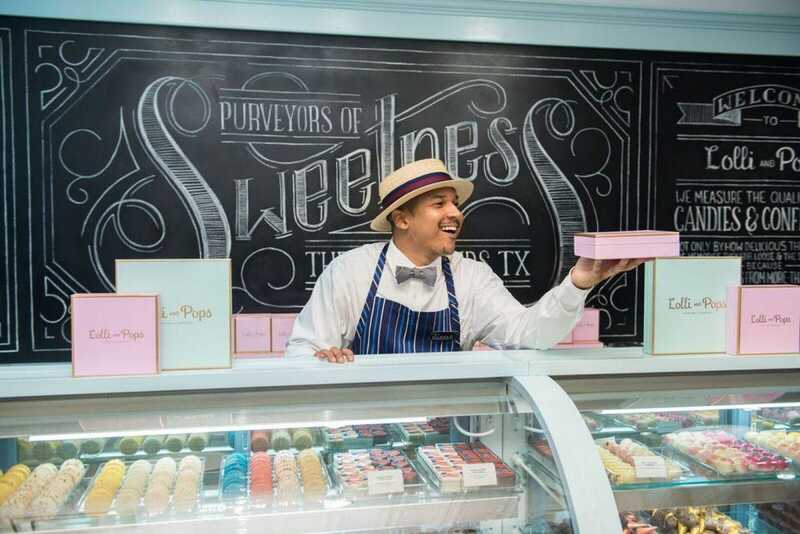 Lolli & Pops delights customers through its store design, which is inspired by old-fashioned candy makers and soda shops, and employee uniforms, which include bow ties and old-fashioned boater hats. Unique flavors such as jalapeno peanut and mango & chipotle chocolate bars, special collections including an extensive assortment of Harry Potter inspired treats, and products from Madagascar, Japan, and other faraway places are also sources of delight. And the brand's delightfulness extends beyond the in-store experience. Customers currently can arrange for gifts to be delivered on specific dates and include hand-written notes, and with an ambition "to be the easiest way to send a gift online," as Whitney Clark, Lolli & Pops' creative director says, the company is building a "seamless online experience that creates delight and empowers customer to give a gift in a different way." The brand's values of care and thoughtfulness are demonstrated in big ways and small details. Lolli & Pops store staff take the time to learn about the chocolatiers and other products makers, the ingredients they use, and how they make the products so they can convey those stories to customers. And as the company develops its own line of products to add to the array of branded options it offers, it takes great care to balance being on-trend and on-brand. Also to optimize store design and merchandising, Jessica and her team pour over hundreds of hours of video footage of their stores, recorded and analyzed by RetailNext, a leading IoT smart store retail analytics provider. They look at how people interact with the products, employees, and each other and make adjustments to improve the experience. They also rely on customer and shopping data to plan product assortment and test and develop new products. Small details like a "tis the season" note on the inside of holiday packaging also conveys care because it "enables a customer not only to feel delighted but also to know that we were thinking about a detail like that," says Jessica. In all, Lolli & Pops is focused on creating a customer experience where its values come to life for customers every day. Jessica says they able to do so because every general manager believes in the values and everyone is focused on ensuring they have the tools to delight customers. Its stores, Whitney concludes, "are the fullest expression of our values." Denise Lee Yohn is a brand expert, speaker, and author of What Great Brands Doand FUSION: How Integrating Brand and Culture Powers the World's Greatest Companies. Lolli & Pops Birthday Party Box is everything you need for a sweet party carefully packed in our signature Lolli & Pops Gift Box. Lolli & Pops Birthday Cake Caramel Corn, 12 Flavor Fruit Gummies, Birthday Sprinkles Crispy Cake, Birthday Cake Topp'd Bar, Birthday Cake Signature Bar, Red Velvet Signature Bar, Strawberry Champagne Signature Bar, 72% Dark Chocolate Signature Bar, 34% Milk Chocolate Signature Bar in a Signature Bar Gift Sleeve. All items are also available separately. Lolli & Pops Fancy Sea Salt Caramels includes 16 caramels in the following flavors: Cypress Flake Sea Salt, Smoked Chipotle Sea Salt, Black Sea Salt, Coffee Sea Salt, Pink Himalayan Sea Salt, Lemon Sea Salt, Alaea Sea Salt & Vanilla Bean Sea Salt. Holiday flavors available: Peppermint, Pumpkin Latte and Apple Crumble. Lolli & Pops Signature Bar Sets are a great way to showcase your favorite Lolli & Pops Signature Bar Flavors which include: 72% Dark Chocolate, 34% Milk Chocolate, Red Velvet, Dark Chocolate Sea Ssalt, Milk Chocolate Toffee Sea Salt, Strawberry Champagne, S'mores, Chocolate Brownie, Coconut Sea Salt, Dark Espresso, Dark Mixed Berry, Popping Rocks, Birthday Cake and Fruity Cereal Milk. Lolli & Pops Scrumptious Strawberry Cotton Candy also available in Classic Pink Vanilla, Tropical Pineapple, Blue Raspberry, and Sweet Watermelon.